Bacon & chive mac n cheese! 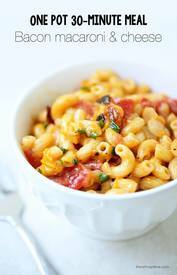 One pot Bacon and chive macaroni and cheese -the Bacon makes this recipe extra yummy! Bacon + macaroni and cheese were made for each other. I can’t even with this dish. This recipe is so simple, but so good. The best part? You can make it in one pot in 30 minutes. It doesn’t get better than that. This is the perfect meal for those crazy school nights. You can have dinner on the table in no time.